This is a recipe that was in Prevention magazine a while back. 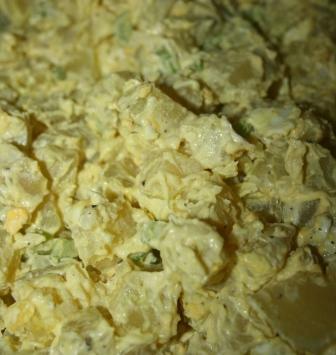 This potato salad has around 130 calories per serving, so fairly guiltless. And it's light and tasty too. Perfect for the upcoming warmer months. Boil potatoes 20 minutes or until tender. Cool. Chop coarsely (I peeled mine this time but they are also good unpeeled). Mix with other ingredients. Chill for 4 hours before serving. My giveaway for two horse mystery novels ends tomorrow, don't forget to ENTER! This would be perfect for a spring picnic. Noted in Reader for future reference. I'm a new WW follower so appreciate this very much! Found you on Multiples and More! I too have 3 boys :) Stop by sometime! Oh that sounds good :) I just might need to make some to go with lunch today. Thank you for the idea! I love potatoe salad! Sadly nobody else in my family does. I have even tried getting my daycare kids to like it. I might have to try this recipe. Than it won't be so bad if I eat it all!! Sound delicious! I will have to keep this for the upcoming summer! I found my way here from Homeschool on the Croft! Glad to have found you! I am not a runner, but am impressed by anyone who is! Amazing to me! Have a great day! This is perfect!!! I've just printed it and will make it next week!!! Thanks. I've tried substituting Greek yoghurt for part of the mayo. That helps a little bit, too.